I got in some more painting on the Old Witch yesterday before I got sucked into Red Dead Redemption. 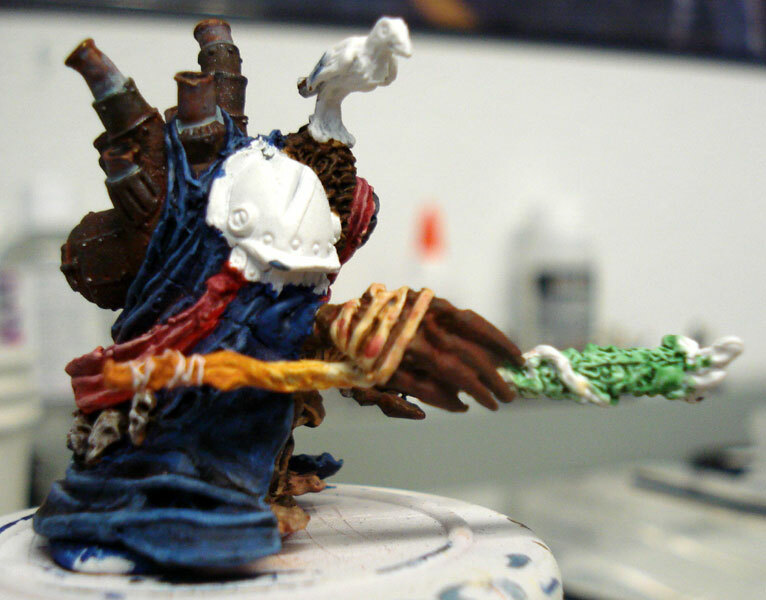 I am really appalled at how slow I am at painting, not sure how I waste so much time–I feel like I should video-record myself or something to see what I do that takes so long… Anyhow, I gave up trying to drybrush the folds of the sash and scarf. I seemed to always have too much or too little paint on the brush, so I just painted along the tops of the folds and then washed with Citadel Wash. I feel like I make no progress, but she also seems to be getting close. I undercoated the satchel with my usual flesh undercoat, Vallejo Brown Rose, and will drybrush a lighter tone to highlight–we’ll see how that goes–then wash with Ogryn Flesh wash. I was going to try to make it look like tanned human skin, but I am not sure that is going to be apparent. 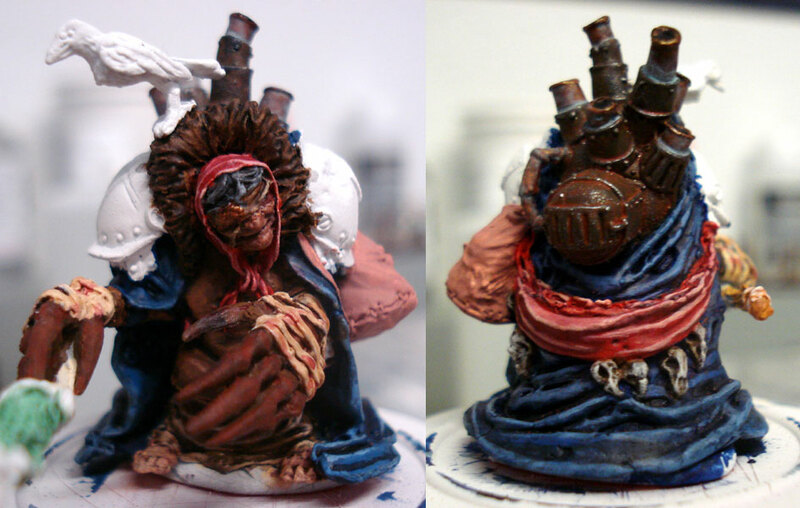 I also painted the bandages around her hands, then washed with Gryphonne Sepia and dabbed red wash in spots. I’ll highlight the edges of the bandages and wash with sepia again, and maybe one more round of highlight and wash if necessary. I undercoated the various skulls with dark brown, washed with thinned ivory, washed with Devlan Mud, and drybrushed with unthinned ivory. I think I might drybrush again before doing another Devlan Mud wash, since the coverage didn’t end up like I wanted it to. I am trying to emulate the color of a stick I found in a park near my home. I will touch up the twine near the base, I was getting tired of detail work at the time, and then will wash with Devlan Mud. The green faces seemed like a good idea at the time, but I feel it’s getting to look a little like a bag of skittles, and I think I might repaint white and then wash the faces blue instead. I am looking forward to finishing with the Crow, at the end. I always find ‘feature’ miniatures take longer. Because they are a focal point of the army you want to put more effort into them. The other thing is that you can’t really do them as part of a production line (unless they share a lot of common colours with rank and file). The Old Witch is starting to look great. Can you estimate how much time you’ve put into her? Are you painting Scrapjack in parallel too? Thanks, Owen! I have spent an hour at a time here and there, and a couple of 2+ hour sessions. I paint to relax and spend time thinking or listening to podcasts, so I lose track of the exact hours, but I probably have spent 8 hours on her so far; I’ve always been a slow painter and am not sure why, I should probably spend more time painting with others. Scrapjack is primed but that’s it so far. Painting is a great way to relax. If you’re happy with the time you spend and the results you get (witch (deliberate misspelling, ha!) look great) then I wouldn’t change a thing. I find I get faster the more I paint of a particular army as my mixes, highlights, washes become familiar. I also keep extensive notes on how I achieved certain effects. These are invaluable as, for example, I’ve been collecting my Khadorans since late 2003 and have added to the army progressively. The same is true of my other armies. I’m looking forward to seeing Scrapjack progress too. I’m hoping to get some more time to paint this weekend, thanks for the perspective!